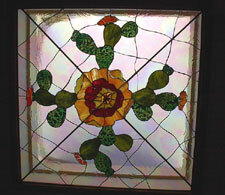 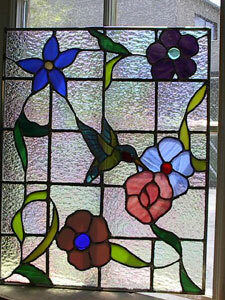 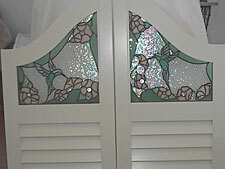 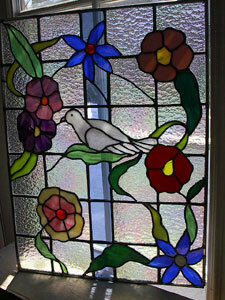 Both stained glass panels and glass mosaic pieces can be used to beautify the interior and exterior of your home. 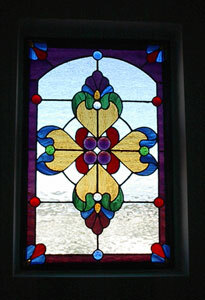 Recent residential commissions completed by Ochoa Stained Glass artisans include stained glass windows added to provide a dramatic design element as well as privacy. 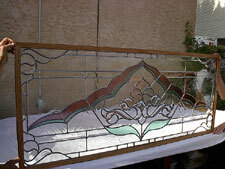 We are happy to meet with you to discuss your design needs. 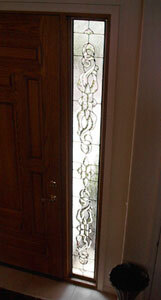 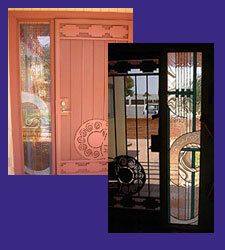 A geometric Native American Indian Rug pattern was the reference for this custom stained glass design, created by Ochoa Stained Glass Artists using a variety of clear textured glass, bevels and framed in copper came for the 3-panel entryway sidelight, another common architectural feature in some of the newer residential developments throughout Southern Arizona. A 3-cluster Calla Lily is the focus of this custom designed stained glass panel created by Ochoa Stained Glass Artists for a dining area to match the client's collection of Mexican Pottery. 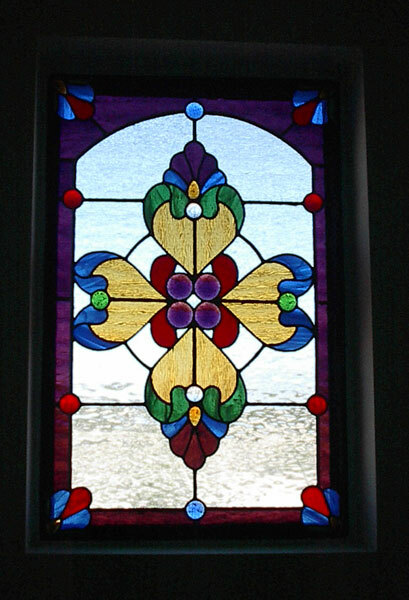 Ochoa Stained Glass Artists use creamy ivory opalescent glass blended with vivid cobalt blue translucent glass, midnight blue hammered glass, and amber wispy glass and bevels to create this simple, yet dramatic Indian Geometric panel commissioned by a client for her Great Room. 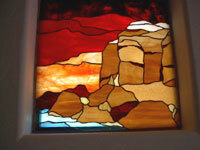 The infamous Red Rocks of Sedona, Arizona were the inspiration for this 2-panel commission created by Ochoa Stained Glass Artists for the dining room of a home in the Catalina Foothills. 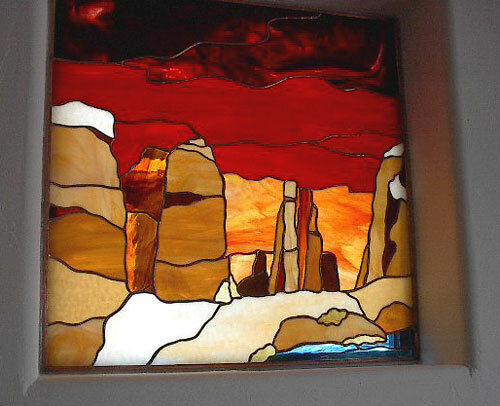 The panel is a bold interpretation of the brilliant red rocks against a red/orange sunset sky. 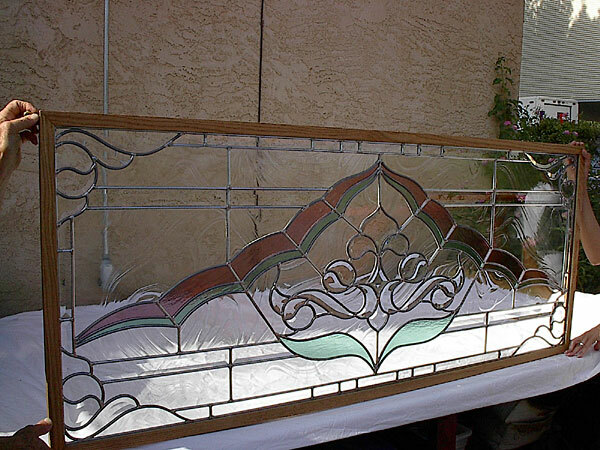 This Victorian-inspired design created by Ochoa Stained Glass Artists is bejeweled with faceted stones and jewel-toned translucent colors and casts a rainbow of colors in the morning sun in an eastern-facing stairwell window for this Tucson resident. 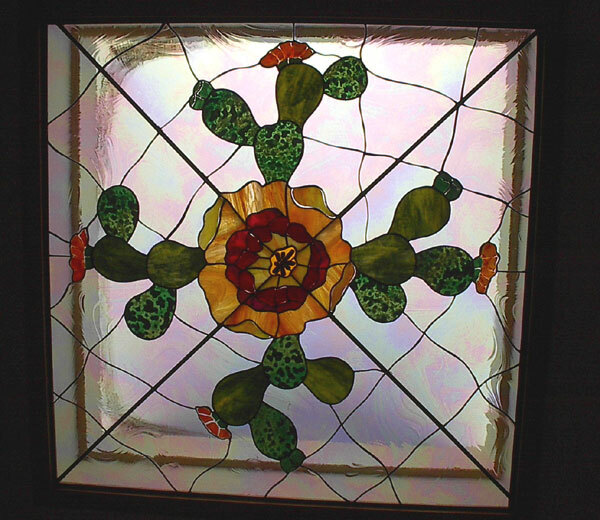 This Ochoa Stained Glass design offers an abstract aerial rendering of one of the Desert's most common cacti-the Prickly Pear-in full bloom. The panel was fabricated as a Skylight for a lovely home on Tucson's Northeast side and incorporates kiln-formed glass elements to add depth and texture to the art glass piece. 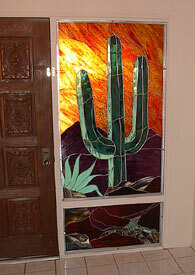 These two panels were commissioned to add color and texture to an indoor swimming area, and designed by Ochoa Stained Glass Artists to complement the original DeGrazia frescoes that adorn the façade of this historic Catalina Foothills residence. 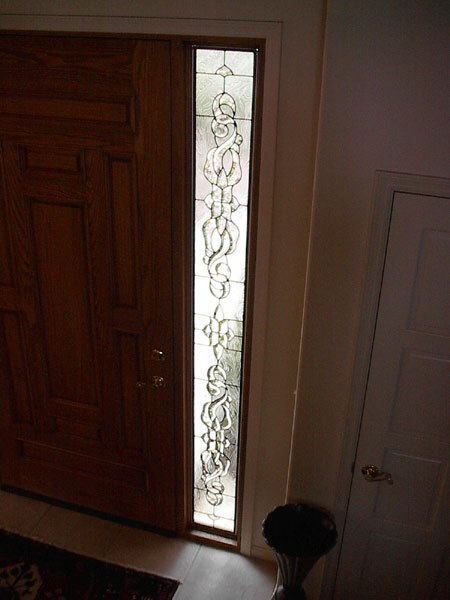 Often, we are asked to design a complementary stained glass panel to match an existing door panel or sidelight, extending the impact of the glass art in creating a more dramatic entryway. 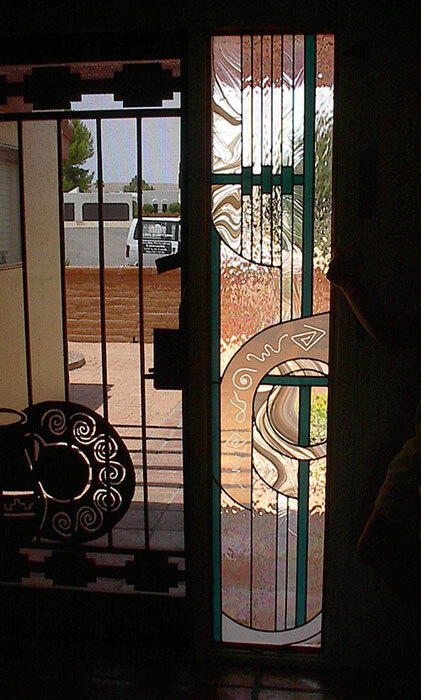 Here, Ochoa Stained Glass Artists created a sidelight to complement the existing door in a 30-year-old home in the Tucson Mountains. 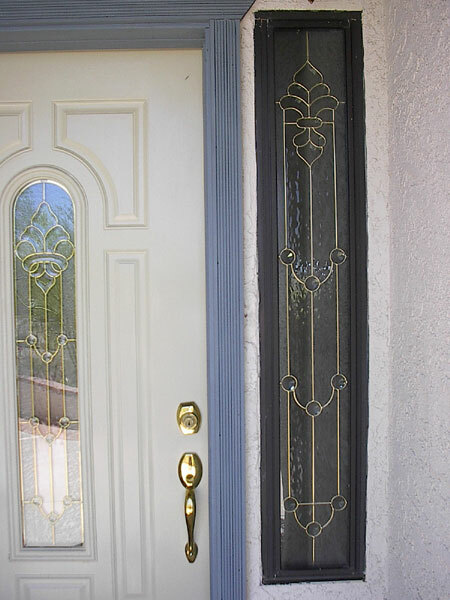 A majestic saguaro and a magnificent century plant are the focal point of these two sidelights designed by Ochoa Stained Glass Artists for the entryway of an Eastside residence nestled at the Foothills of the Rincon Mountains. 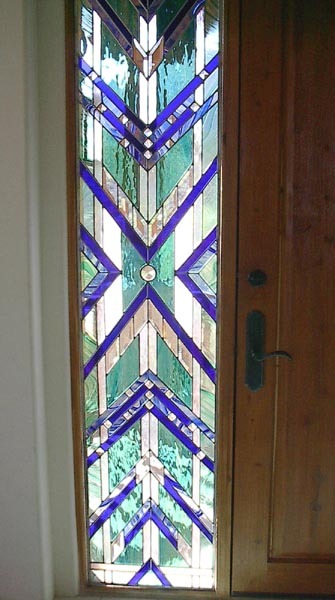 A spectacular sparkling bevel cluster is the centerpiece for this traditional stained glass entryway sidelight, designed by Ochoa Stained Glass Artists for this La Paloma Country Club residence. 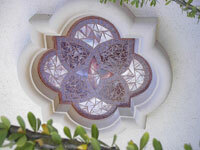 The cluster was chosen to complement the intricate wood carving of the entryway door. 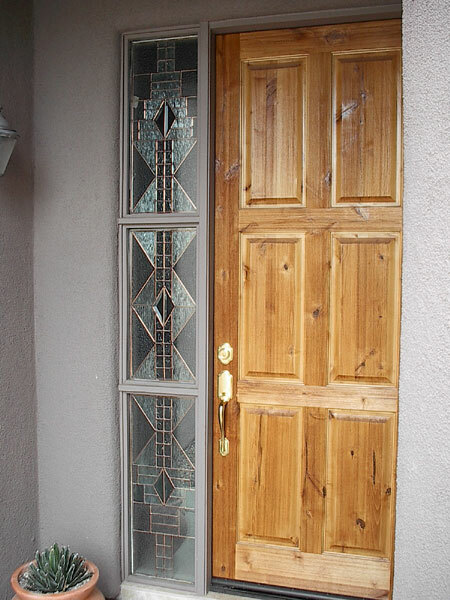 A majestic saguaro is the focal point for this two-part sidelight panel created to update the décor of an entryway to a home nestled in the Tucson Mountains. A set of sparkling café doors created for a Northwest Tucson home in cooperation with Whitney Burns Shutter Company. 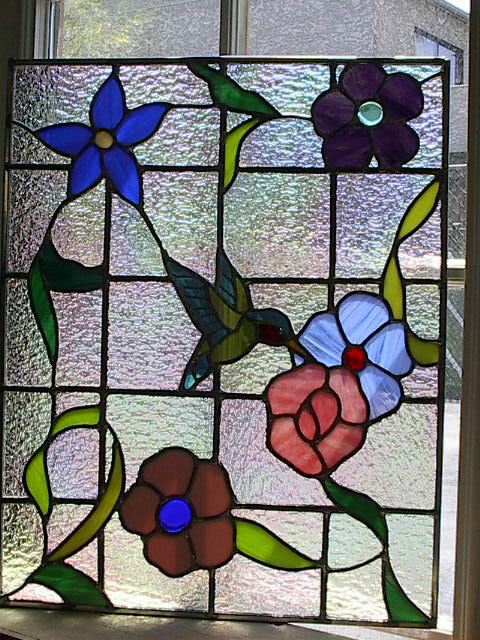 The stained glass portion incorporates the client's favorite flower and hummingbirds to bring a colorful bit of nature to the entry way that connects her kitchen and family room. 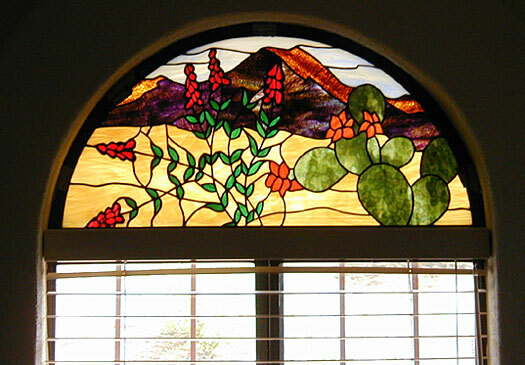 A custom-designed Victorian beveled panel, framed in oak, created to hang in front of a window in a desert home just south of Tucson. This one-of-a-kind, scenic southwest panel lamp was commissioned as a centerpiece for a great room in a desert home located in the Rincon Mountains in Tucson. 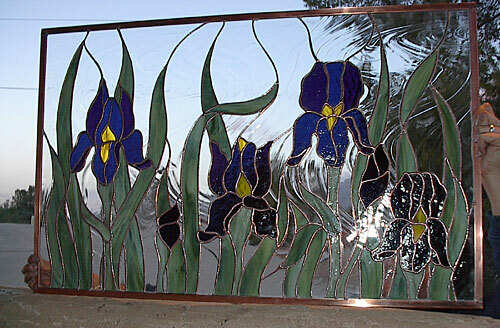 In this transom panel created by Ochoa Stained Glass for a home in the Tucson Mountains, the artist has used a clear textured glass known as "baroque" to create the feeling that this field of Irises are blowing in the wind. 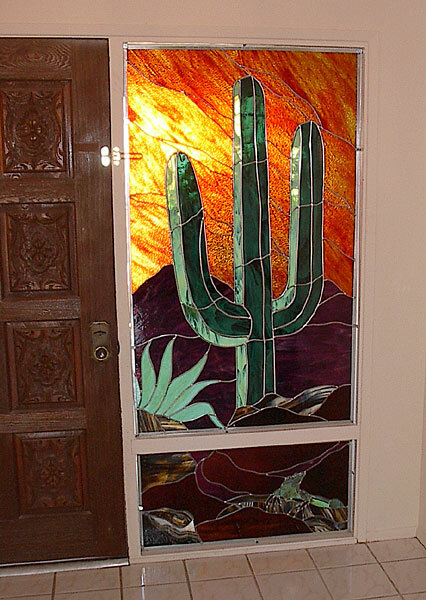 A stunning Mission style stained glass panel commissioned for the sidelight of the entryway to one of Tucson's grand Foothills homes. 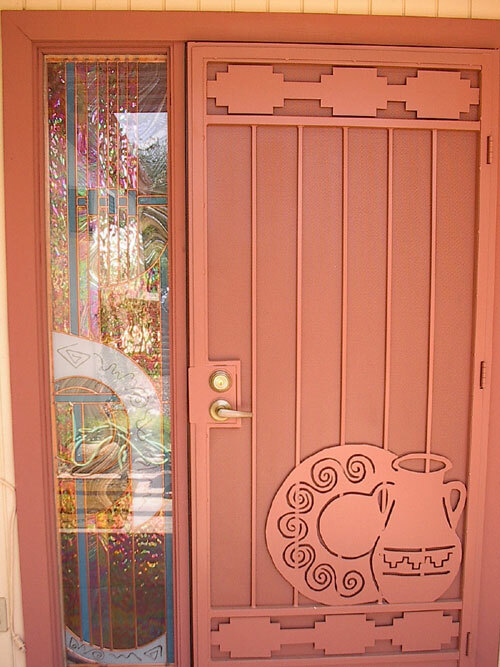 A sparkling sidelight for the entryway of a Green Valley, Arizona home that uses both stained glass and sandblasted glass pieces with copper came to create a dazzling southwest design that blends contemporary and primitive elements. 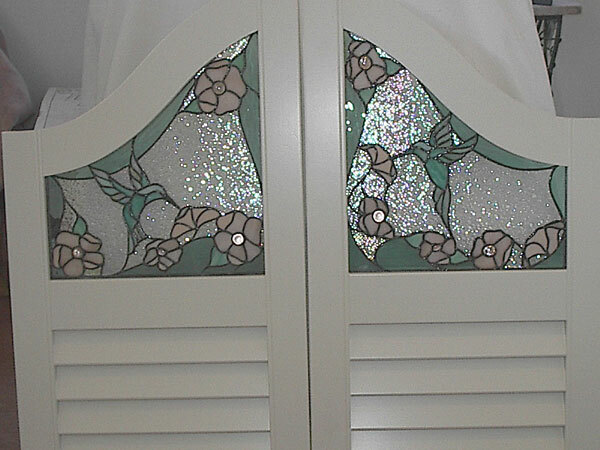 The same dazzling Green Valley sidelight from the inside looking out. 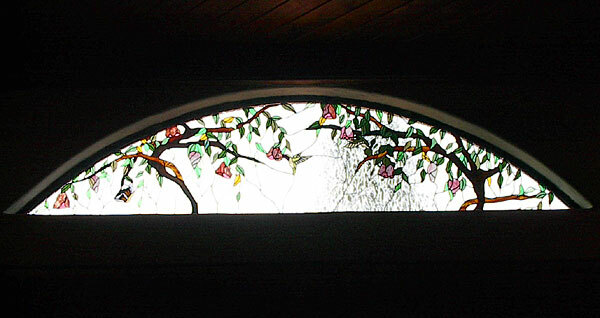 This custom-designed transom panel creates the illusion that just outside the sliding glass doors of the living room that lead to the pool area there is a fully flowering tree with magical hummingbirds partaking of its nectar year-round. 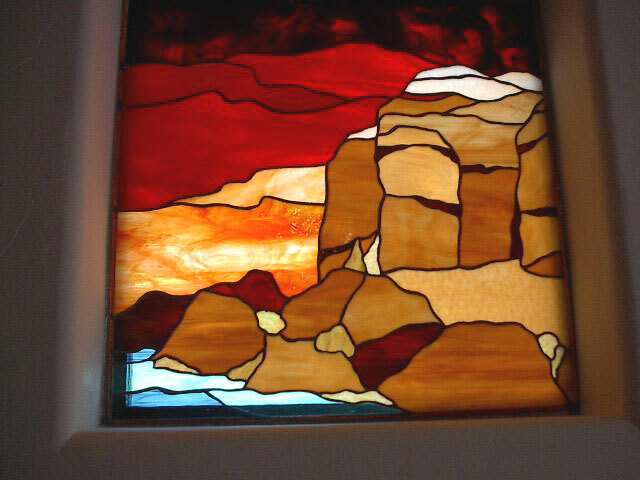 This glass art piece was designed for our client by Ochoa Stained Glass Artisan Adriana Grajales to capture the magic of spring in the desert all year long. Entry way transom custom designed for a home in northwest Tucson. 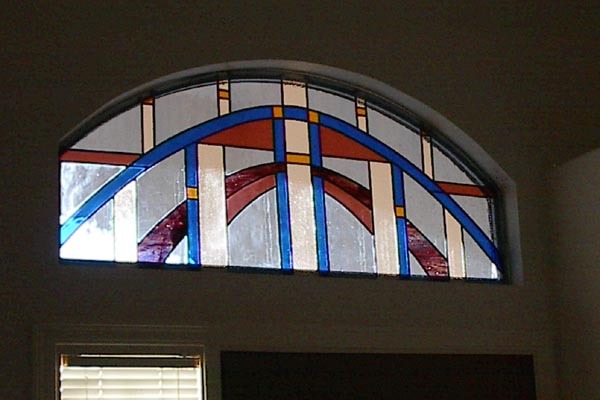 One panel of a set of arched transoms created to block the intensity of the Southern Arizona sun and designed to mirror the view outside the windows of this home nestled in the Tucson Mountains. 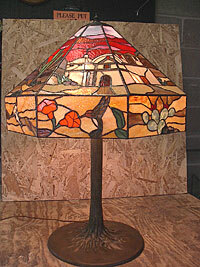 Glass mosaics architectural accent in a foothills home.